We both always knew we wanted to have children. We love kids and have worked with children for most of our lives, which is actually how we met. When we were in the planning stages, it was always our intent to become foster parents. There is a huge need in our state (just like all others) and we felt a calling to support families and our community in this way. It wasn’t necessarily our goal to adopt from foster care, but we were open to it if the need arose. We also always hoped (assumed, really) that my wife would conceive via IUI with donor sperm from a bank. She, like many women, always had a desire to carry a child whereas I had none whatsoever – so the decision on who would try to get pregnant was simple…at least at the beginning. After 2 years, countless procedures, many IUIs, 2 IVFs, a bunch of doctors and thousands of dollars, it became clear that getting pregnant was just not going to happen for us. It was heartbreaking. But thankfully, in the meantime we were fostering a fantastic sibling group and falling more and more in love with them with each passing day. When they became available for adoption we didn’t hesitate for a minute with our resounding: YES! Now we are forever moms to three awesome kids and have the family we never knew we always wanted. We haven’t shared our struggles with infertility too widely. With the exception of a few close friends, we had been keeping our tries to conceive under wraps with the hope that one day we’d have that big happy announcement to share. Sadly, that day never came and now that we are past all of it, there just never seems to be a good or appropriate time to bring it up. On the other hand, friends and family were certainly aware of our foster journey. For the most part they were wonderfully supportive and loved the kids from the start. The one thing we did notice with certainly family members was the way that they kept a bit of a wall up. Nothing we perceived as malicious or even completely intentional, and we knew it was their way of protecting themselves against the pain they would feel if the children left, but it did hurt to see them keeping distance and treating the children differently than if they were biological. It’s a tough position to be in. Looking back I wish we had more conversations with our families about our plans to foster, our expectations, and their feelings – I think those open conversations before welcoming placements could have alleviated some of the tension and hurt feelings. What are some of the challenges you’ve faced raising children as a lesbian couple? How have you overcome those challenges and what advice would you give new parents in a similar situation? Thankfully we’ve faced very few challenges (arising out of being a gay family anyway!) and I think that has a lot to do with the area we live in. We are only one of many gay families in our town. I do wonder if this answer may change as the children get older, though. The advice I’d give for new parents would be to actively seek out other families like yours. There is so much strength in community and children love to see other families just like theirs. No, we knew we’d be parents one way or another. There were times when the odds seemed completely stacked against us – like when we found out that our second IVF had been unsuccessful and the children were going to be reunified with their bio mom in the same week – but we took one day at a time. We never lost faith. But then there are the big things…knowing my wife on such a deeper level, feeling pride like I never have before, laughing more, and gaining the knowledge that no matter what life throws at me or how dark the days get, my faith will bring me through. Life changes so much when you become a parent, but it’s not something you can fully describe or understand until you are there…you just have to see for yourself! Adopting from foster care is just as they advertise: Free. All costs were paid by the state and, due to our state’s regulations and children’s circumstance, we will also continue to get medical insurance until they are 18 and full college tuition for each of them. On the flip side, we sorely under-budgeted for trying to conceive. Most of the treatments were not covered by insurance and what was covered exhausted our infertility benefit within the first few months. Let’s just say we stopped counting when we got to $10k out of pocket…and that was long before we called it quits on trying. No, if anything my state goes out of its way to recruit gay and lesbian foster/adoptive parents and we never felt treated any differently as 2 moms. Will you prepare your children to answer questions about their biological parent(s)? We plan to be completely open and honest with our children about their bio mom, in an age-appropriate way, of course. In fact, it’s our hope that they will be able to continue a relationship with her akin to an open adoption. 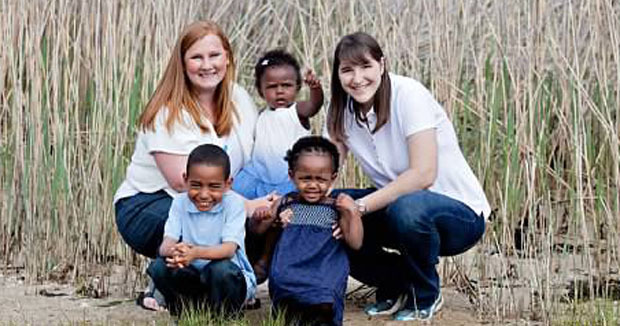 We worked directly through the state for fostering and the adoption. We began our tries to conceive with the Alternative Insemination Center of Greater Boston. We chose them for their reputation for working with lesbians and low provider fees. We were very happy with our experiences there, but it became clear after a while that we would need something more. So, we switched to the Center for Advanced Reproductive Services at UCONN. Again, we had a good experience with the providers and despite not being successful, we are confident we received great care and treatment there. Follow Elise and Andrea over at their blog, 2mommies2be.com.